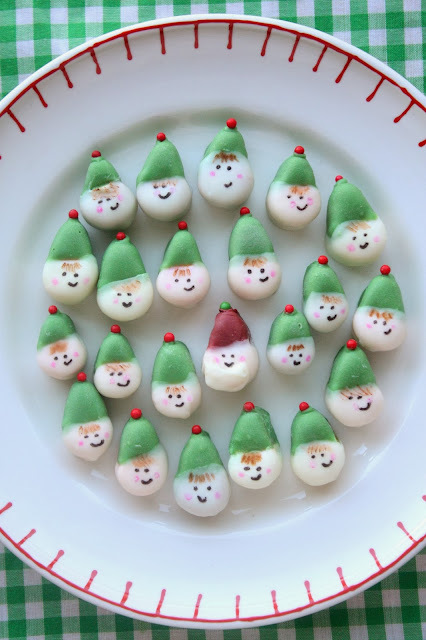 I know it's not even Thanksgiving yet, but when I first thought of turning these little marshmallows into elves (and Santas), I couldn't wait to see how they would turn out! Besides, Christmas is not that far off, and since Thanksgiving is so late in the month this year, Christmas will creep up on us even faster! Put some of these little guys in a cellophane bag tied with a ribbon and you've got a cute little gift for a neighbor, teacher or friend. Melt white candy melts according to pkg. directions. Holding the tip of the marshmallow, dip into the white melted candy to cover the wide part ("ice cream" section) of the marshmallow. Set on wax paper to dry. Do this to each marshmallow. Melt the red and green candy melts. Hold the wide part of the marshmallow (already dipped and dried) and dip the tip ("cone" section) into the red or green melted candy. Using the edible markers to make hair (brown marker) on the elves, pink on cheeks for all, and black for eyes and mouth on all of them. Using the tweezers, pick up a jumbo sprinkle and barely dip the top of it into the melted red or green (depending on hat color) candy melt, and add to the top of the hat(mine all adhered right away). Gently set on wax paper to dry. For the SANTAS, use a toothpick and dab on a bit of the white melted candy to make a beard. So creative, Sue... I'll definitely have to make them! Awwww, those are darling. What a great use of an ice cream cone marshmallow. Sweet! 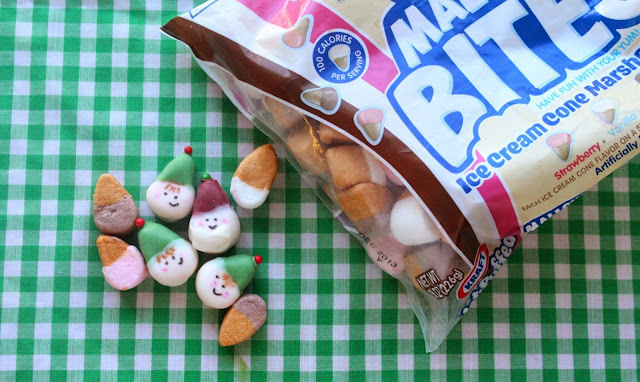 This is a cute and creative use of the ice cream cone marshmallows. I like how you personlized them with the edible markers. I can't even.....these are the cutest things ever!!!!! Too adorable to eat them, Sue. You're little elf minis are so super cute - I don't think I could bring myself to take a bite! Oh, but wouldn't they look cute served with cocoa this Christmas? Wonderful creative idea! They are so cute! Where did you find this idea? I`m sure that they are not just pretty but also very tasty. I think my kids going to love it! This weekend we will definitely try to make the same once. It will be as a repetition before Christmas. These are so adorable! I have a question. I haven't been able to get the markers to work on the candy melts. They just kind of slid over the surface. What brand are you using? You outdid yoursELF on these. Simple & clever wins in my book every time. Sue, these are absolutely adorable!!! Oh my goodness--these are TOO adorable. What a great idea! 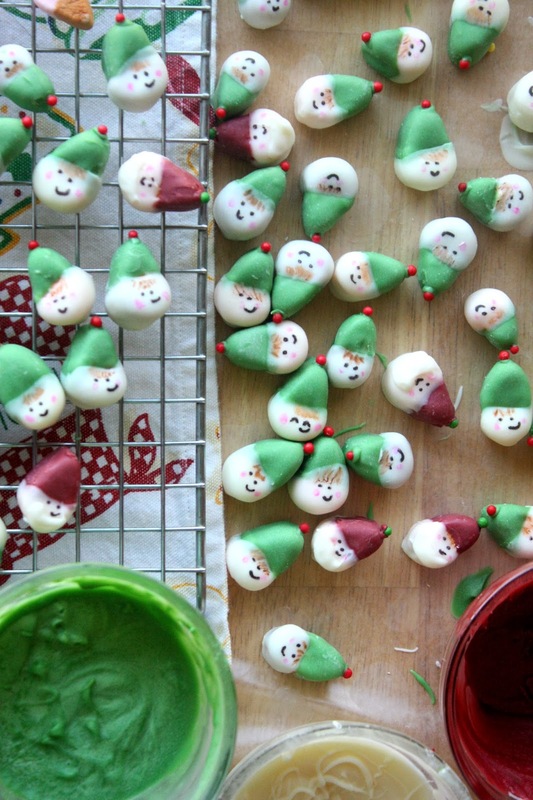 I've never seen those marshmallows before, but these would make the perfect decoration over the holidays. I'm just thinking Christmas movies in November!!! No actually what I'm thinking is these are sooo cute. I have never seen ice cream marshmallows in the shops here in the UK but I'll be keeping my eyes open for them! Oh my! These are the cutest Mini Elf I've ever seen. Very cleaver use of the treats. 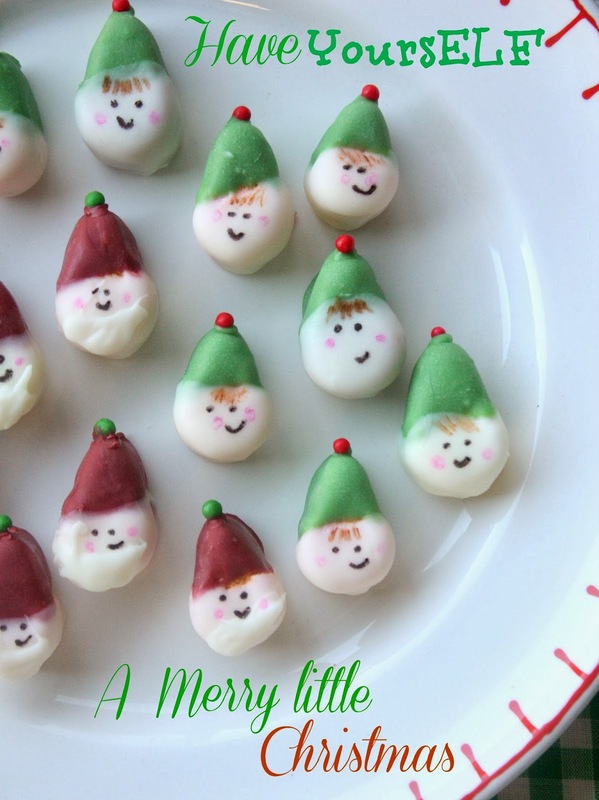 I now my kids would love to make these Mini Elfs with me and pack them up for their school friends! Mm, love these! Super cute idea! Perfectly adorable, and you are so 'punny'. I just made a batch of these today for my daughters class. It took me hours! But it was fun and they came out awesome. I did 25 bags of 5 elves and one santa in each. Used clear round candy bags, tied with bakers twine and tied a card using your "have yourself a merry little Christmas" on red/green glitter card stock. So creative of you, thanks for the post! !